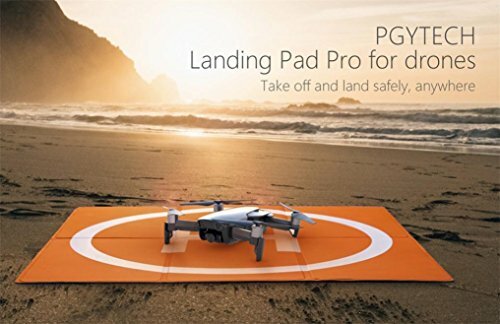 Inverlee Quadcopter Parking Carpet Portable Foldable Landing Pad for DJI MAVIC AIR/Spark (Blue) by Inverlee at Open Drone. Hurry! Limited time offer. Offer valid only while supplies last. Features: Portable design, easy to carry. Premium Material - High quality PU waterproof material, light and portable, easy to unfold and fast-fold. Premium Material - High quality PU waterproof material, light and portable, easy to unfold and fast-fold. The landing pad side make of elastic material, be careful of the unfolding. Perfect Design - Double side double color design. Application of different occasions, Highlight the location of the Helipad. Portable and Foldable, easy to carry out. HIGH PROTECTION: Protect your drone from sand, dust, grass or other debris that might get into the electronics and destroy your drone.